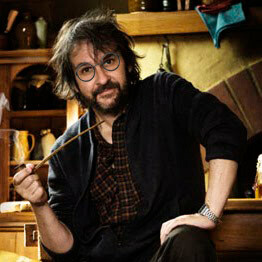 In response to the lukewarm critical reception of “The Hobbit: An Unexpected Journey”, Peter Jackson has announced that he will begin wearing his eyeglasses again. While Jackson hasn’t worn glasses for years and no longer uses his old prescription, he has planned a workaround to the problem. “I can simply pop the lenses out of my old frames, and we’ll be good to go– that is, if I can find them!” he laughs. But putting the glasses back on is only the first step. Plans are also underway to add glasses back on to all of the behind-the-scenes footage of Peter that has been shot for the Extended Edition DVDs. Since Weta Digital is already too busy working on effects shots for films two and three, Richard Taylor and Weta Workshop have been placed in charge of the eyeglass project. Using a recently perfected technique combining advanced facial-recognition software with a slave-motion camera rig, the glasses will be added to Peter’s face using green screens and carefully crafted models. Weta Limited Edition replicas of the glasses will be available as a Comic Con Exclusive in July 2013. Early fan reaction to the news so far has been positive, and representatives from Warner Bros. were optimistic as well, and in a statement have expressed confidence that the reintroduction of spectacles to Jackson’s image is the right way to go towards making up for the box office disappointment of “The Hobbit: An Unexpected Journey”. Will the glasses really make a difference? What do you think? Sound off!